In North America: Now on top of the 80%-off Education pricing, receive three extra bonuses for a limited time: free portable speakers, a laptop sleeve, plus free shipping with the purchase of any Student and Teacher Premium Creative Suite. 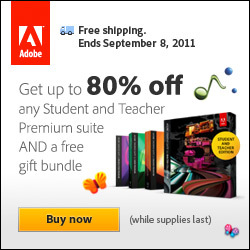 Please note that delivery of the Adobe gift bundle will arrive separately to delivery of the product. Good while supplies last, free shipping available through September 8, 2011. In Europe: Receive €50/£40 off Creative Suite Student and Teacher Editions plus free shipping! Offer valid in the UK, France, Germany, and Europe Education Stores. Offer available from 29 August 2011 – 19 September 2011. Learn more about the CS5.5 Student & Teacher Editions, including (importantly) what’s the difference between these and the regular versions.